Only when your plus one works in tourism does a girl have to beg her beer loving boyfriend to check out a new tasting room. She wants what’s new. He wants what he knows. Well, this time the girl definitely knew best, and the guy wasn&apos;t afraid to admit it. 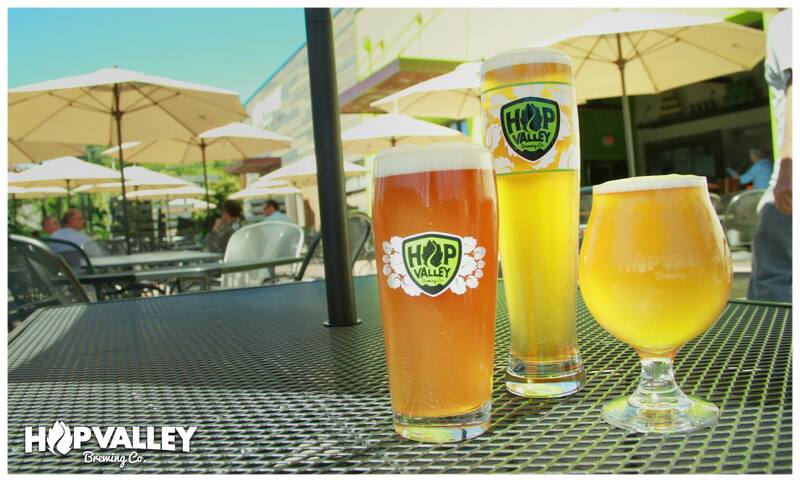 Case in point: this weekend I (said tourism girlfriend) wanted to go check out Hop Valley Brewing Co.’s new tasting room in the Whiteaker neighborhood. “The Whit” has fast become the hub of Brewgene and hotspot for all things fermented. 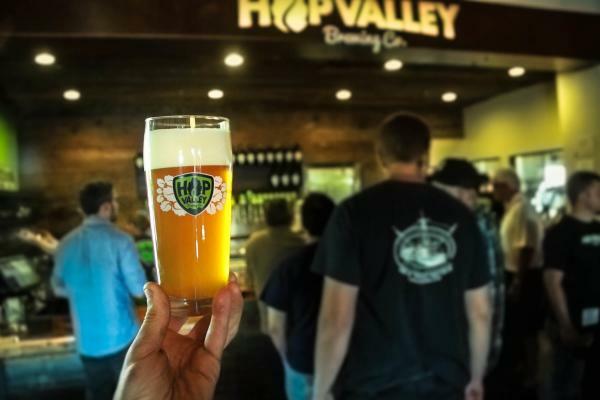 Hop Valley’s new digs are just north of Ninkasi Brewing and west of Oakshire Brewing.I had one hesitation heading out to the new brewery – How would Hop Valley make their tasting room different than the other guys? From Falling Sky’s colorful chairs to Oakshire’s dark wood furnishings to Ninkasi’s industrious, yet smooth turquoise, cement patio, the others are awesomely different yet equally cool. 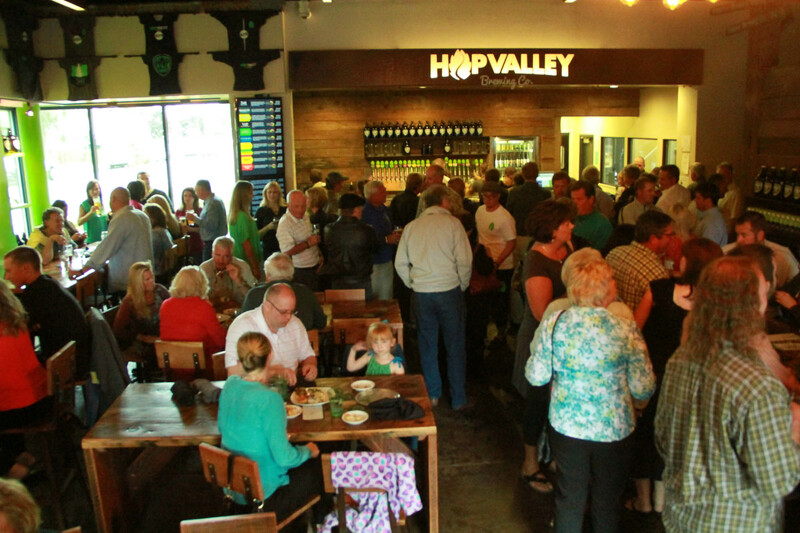 So how would Hop Valley stand out but still fit in to Eugene’s craft beer scene? Hop Valley’s answer? Make it bigger. Make it unique. And build three tasting experiences under one roof. You order in one room, choosing from a digital pour list. Either stay in there to sip or head to the next room, a wide open space with windows overlooking the inside of the brewery. The third area is a huge patio with umbrellas and picnic tables. Oh, and did I mention the shuffle board table? Brownie points from Blancett. I tasted the Karma Chamomleon (a saison) and the Beers In Da Hood (a dry hopped cask IPA), and opted for the Hood. Thank goodness I did! Turns out, this was a limited edition brew. The newly renovated 30,000 square foot space, plus the current Springfield location allows the brewers to experiment more with single batch beers, so you never know what you’ll find on tap in the tasting room. Not only did Hop Valley nail it with the beer but also with the food. Homemade pretzels, hot wings & mozzarella ball bread sticks AND plenty of TV’s so I can watch my Ducks? When can I move in? 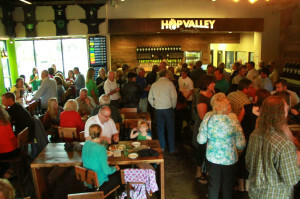 To put it simply, Hop Valley knocked it out of the park with the new tasting room. Molly Blancett is a previous social media manager for Travel Lane County. Work brought her to Eugene, but her love for the city and the region kept her here. Molly enjoys the Eugene, Cascades & Coast region by running Pre's Trail, sipping wine at Sweet Cheeks or hiking to a new waterfall.